JBL Control SB-210 Surface Mount Subwoofer DJParts - All Variety of Parts that DJ Needs. 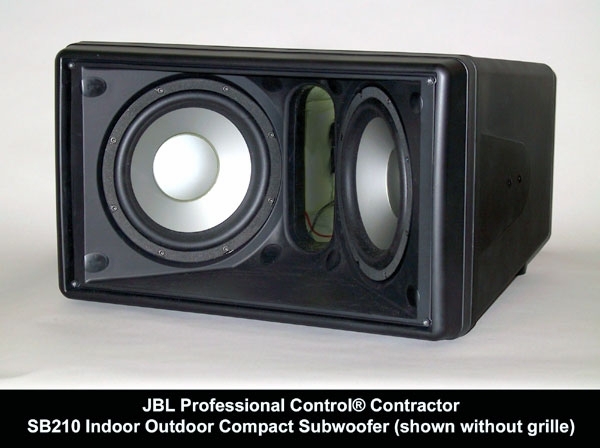 The Control SB210 provides low frequency reinforcement for a wide variety of sound system applications. Its compact size, high output and outdoor capable design makes it one of the most versatile subwoofers in the installation market. The internal angled baffle allows for a large port opening and compact front dimensions without compromising driver size. The SB210 produces warm, punchy low-end sound. The Aluminum/Ceramic Composite Diaphragm 10" Drivers are rated for pink noise power handling of 200 Watts each, providing 400 Watts (1600 Watt peaks) of system power handling. The dual driver design also allows for stereo operation of the enclosure and provides great flexibility when used with one of the optional network accessory kit. Choose the MTC-210-SAT network accessory to drive a full subwoofer/satellite system with one amplifier. The network receives a stereo or mono source, and sends a high-passed 4-Ohm or 8-Ohm Satellite output signal for operation with other Control loudspeakers. ATC-210T-SAT network can be used in same manner when using a 70.7/100- Volt distributed signal line. Included with the SB210 are four feet and four receptacles to allow floor and shelf mounting as well as reliable stacking of multiple units. The thirteen M6 insert points allow for installation using forged shoulder eyebolts for suspending the subwoofer. The Optional UBracket MTC-210UB allows for additional versatility in mounting. The High Impact PolyStyrene (HIPS) cabinet is available in black or white (SB210-WH) and is paintable. The thermoset composite-coated grille stands up to UV as well as humidity and direct exposure to water. The grille is backed with a combination of materials that, while acoustically transparent, prevent the intrusion of water into the cabinet even when hit directly, such as from rain or a sprinkler. Low Frequency: 2 x 250 mm (10 in.) dia., 50 mm (2 in.) edge wound ribbon voice coil, Aluminum/Ceramic Composite cone. Environmental: IEC 529 IP-X5 rating. Exceeds MilSpec 810 for humidity, salt spray, temperature & UV. Passes Mil-STd-202F for salt spray. Termination: Screw-down terminal strip, zinc plated copper base, nickelplated metal screws/washers. Accepts up to 9 mm outside, 4 mm inside open lug (#6, #8 or #10 lug), plus bare wire (up to 12 AWG/2.5mm2). Included Accessories: 1 pc MTC-PC4 input panel cover, 4 pcs MTC-210FT floor standing foot, 4 pcs MTC-210RT foot receptacle for stacking. Optional Accessories: MTC-210UB U-Bracket MTC-210-SAT stereo/mono high passing network with Satellite outputs MTC-210T mono network with transformers for 70.7/100V distributed line systems. Taps at 250W, 125W, 62W (plus 31W for 70.7V only). MTC-210T-SAT stereo/mono high passing network with Satellite outputs and transformers for 70.7/100-Volt distributed line systems. Taps at 125W, 62W, 31W (plus 15W for 70.7V only).